We have upgraded our Fuzhuan cha 茯磚茶. Fuzhuan cha is also called Fu Tea. This tea is an essential source of minerals for nomad people who live in the North West of China. 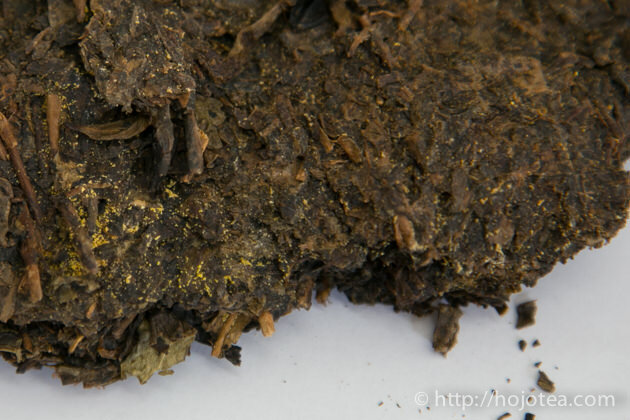 Fuzhuan cha is categorized as the dark tea, the same category as ripe pu-erh tea. Both are the post-fermented tea by microorganism. However, there is a big difference in the processing of Fuzhuan cha and ripe pu-erh tea. Pu-erh tea is fermented in loose form, while Fuzhuan cha is first compressed into the brick shape then preceded for fermentation. Naturally, different types of microorganism are involved in the fermentation. As a result, it produces distinctive flavor and unique characteristics of Fuzhuan cha. The flavor of Fuzhuan cha is very distinctive. Its flavor is developed during the fermentation by a specific mold. It gives a sweet herbaceous flavor like straw, woods or fresh wild herbs. Generally, the flavor of Fuzhuan cha is very pleasant and easy to be accepted. It is very popular among our customers. In addition to the flavor, it gives very long-lasting aftertaste thanks to the tea that is grown without fertilizer. Just like pu-erh tea, Fuzhuan cha is suitable for aging too. Once it is successfully aged, Fuzhuan cha develops fruity flavor like dried figs. When this tea is nicely aged for more than a few years, the tea liquor becomes darker brown and it gives distinctive sweetness on palate. 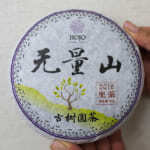 In China, the aged Fuzhuan cha is always sought after and it is sold at higher price. In general, Fuzhuan cha matures faster than pu-erh tea. Based on my experience, Fuzhuan cha ages better without oxygen, although it also reasonably ages well if tea is exposed to oxygen. Some people thought that oxygen is essential for aging Fuzhuan cha since the mold in Fuzhuan Cha is still alive. 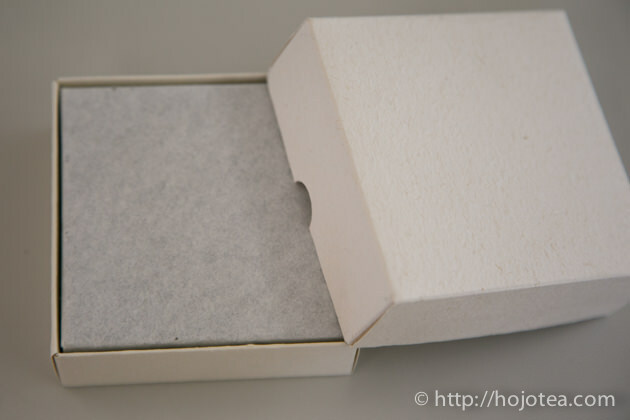 However, due to very low moisture content of the tea brick, the mold does not involve in further maturation of tea. In China, a lot of scientific researches have been carried out on Fuzhuan cha. It has very unique activity to aid in reducing fat in our body. Zhou et al. BMC Complementary and Alternative Medicine 2014, 14:263 found that a rat given Fuzhuan cha reduces its liver fat and triglycerides significantly. They added that the intake of Fuzhuan Cha is in proportion to the reduction of those fats. 肖文军 et al. 茶 叶 科 学 2007，27（3）：211~214 carried out the experiment based on both rat and human. According to the literature, the quantity of Fuzhuan cha intake proportionally reduced both cholesterol and triglycerides. At the same time, Fuzhuan Cha intake increased HDL cholesterol, that is known to be the good cholesterol for our body health. This table shows the reading of cholesterol (C), Triglycerides (TG) and HDL-Cholesterol (HDL-C). Table 1 is of rat and Table 3 is of human. In Table 1, it shows the reduction of cholesterol and triglycerides and increment of HDL-C when the intake of Fuzhuan Cha increases. The result in Table 3 (Human) also shows the same trend as the rat if you compare the result of “Before Drinking” with “After Drinking”. Although those science papers showed significant result of this tea in reducing cholesterol and triglycerides, I am not sure if I can take those reports at face value. Nevertheless, since there are a number of scientists carrying out similar experiments and reporting the similar outcomes, it should not be too far from facts. It is very good news if Fuzhuan Cha can aid in reducing fat. Fuzhuan cha is made in central China and being supplied to Mongolia, Inner Mongolia, Tibet and Xinjiang Uygur Autonomous Region. The living environment in these regions is very severe, huge temperature gaps, and surrounded by vast desert. Their diets are mainly meat, dairy products and bread. So, they are always lack fresh vegetable. For them, Fuzhuan cha is a very precious source of minerals and vitamin, and other substances such as poly phenols. 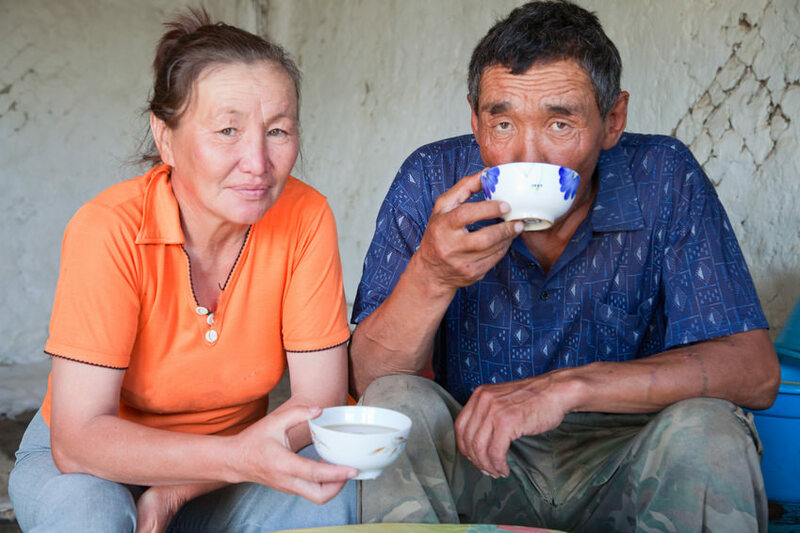 For them, Fuzhuan cha is not just a tea but an essential source of nutrition. In Mongolia, they sometimes drink Fuzhuan cha with butter. The trading history between central China and Mongolia, Tibet and Xinjiang Uygur Autonomous Region has been very long. Tea was exported during Tang dynasty. 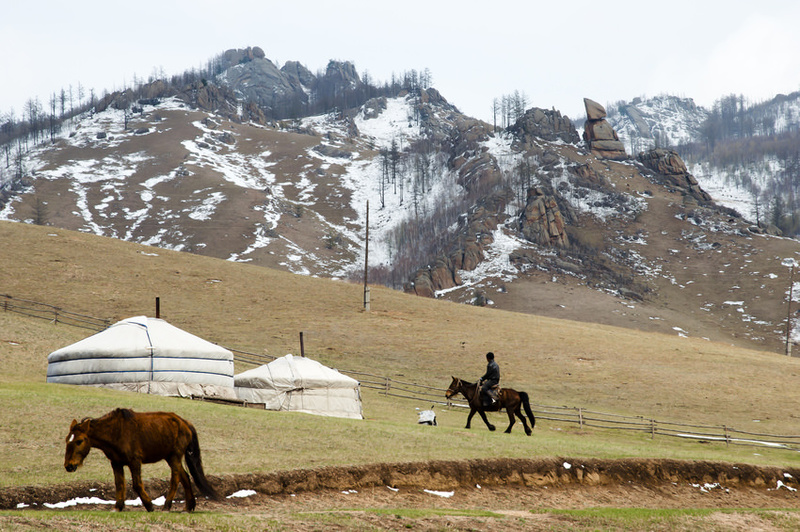 From central China, tea was one of the main trading items to exchange for the horses from Mongolia. This tea and horse trading was called 茶馬互市, that was fully controlled by the specific department of government. It was started since Tang-Song Dynasties and flourished in Ming-Qing Dynasties. 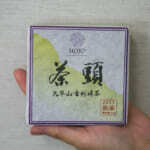 Therefore, these teas were called 官茶 or 府茶 as tea trading was carried out by the government. In those days, teas exported to those regions were green teas or similar kinds. It was the similar tea as the Hei Mao-Cha of Fuzhuan cha. 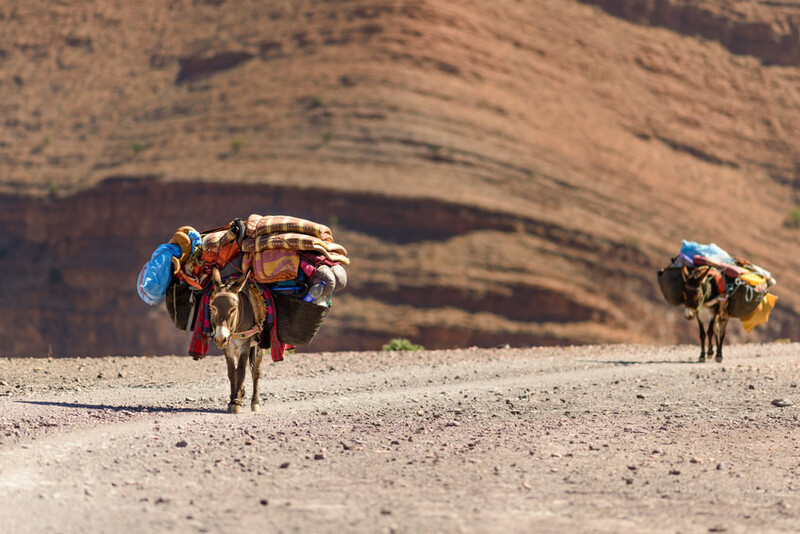 Tea was tightly packed, loaded on either donkeys or horses and traveled for a few months. 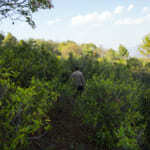 During the long journey, tea was exposed to rain, moisture and high temperature. 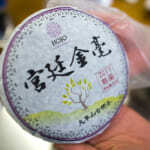 It was said that tea was fermented unintentionally due to high temperature and humidity. Interestingly, the flavor and taste of tea developed by this natural fermentation was well accepted by people. Due to the popularity of the taste and flavor of fermented tea, the process of Fuzhuan tea was invented in Shan Xi Province (陜西省) in 1300s during Ming dynasty. Tea was first compressed and fermented by mold. Subsequently, Fuzhuan cha and the similar kind of dark teas were produced not only in Shan Xi but also in Hunan and Sichuan province. These teas were the precursor of so-called Dark tea. The production of Fuzhuan cha consists of two major steps. The process of making Hei mao-cha is as follow. This process is similar to the process of some Chinese green tea such as Shui Xian green tea of Phoenix or Liu Bao tea of Guangxi province. The tea produced with this process is called Hei Mao-cha. Hei means Dark and Mao-cha means crude tea. It means “crude tea for making dark tea”. The piling process is often explained as fermentation in various tea books. However, it is not the fermentation as tea has been pan-fried and enzyme is completely inactivated. In addition, it is not the microbiological fermentation either since the timing of piling is as short as 12-24 hours. 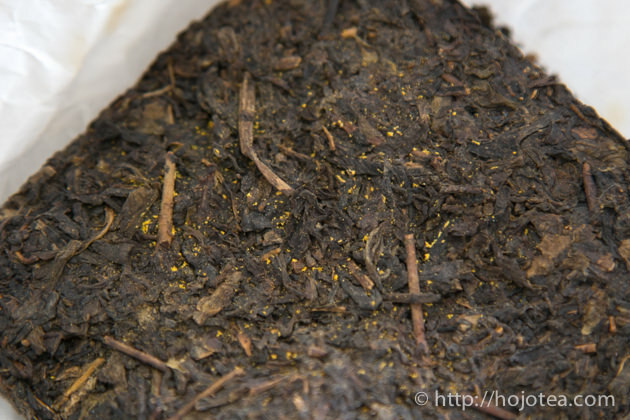 The purpose of piling process is similar to the smothering process (悶黄工程) of yellow tea. When keeping tea at high moisture for some time, it promotes moderate oxidation of tea substances and makes the taste of tea mild and gentle. 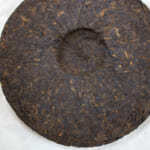 In fact, raw pu-erh tea undergoes similar process after pan-frying process. Tea is piled for about 12 hours until the next day. Thanks to these piling process, both pu-erh tea and Hei mao-cha gives smooth taste and easy to drink. The baking process is not a distinctive process for Hei mao-cha. It is also used for making Chinese green teas. 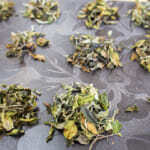 It is to enhances the taste and flavor as well as drying the tea. 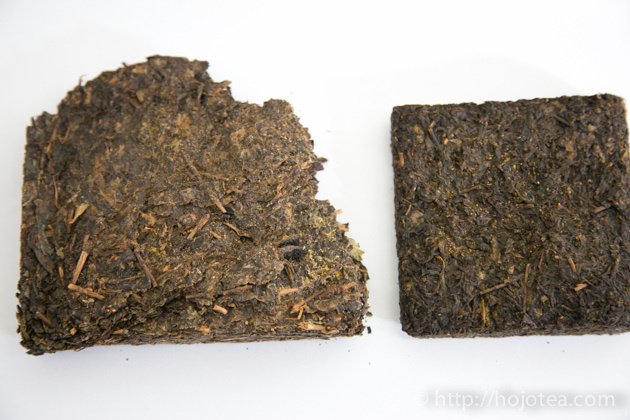 The Hei mao-cha is then compressed into rectangle shape or square brick and kept under high humidity. During this process, the mold originated from leaves and environment start growing. If the process is carried out properly, the golden/yellow spots naturally appear inside the brick. In Chinese it is called golden flower (金花). It is a very important symbol of Fuzhuan cha. The golden flower is the spores of specific type of mold called Eurotium Cristatum from the Aspergillus Family. Usually, if more golden flower exists it is considered as of better quality. However, the golden flower itself does not give any specific flavor or taste. 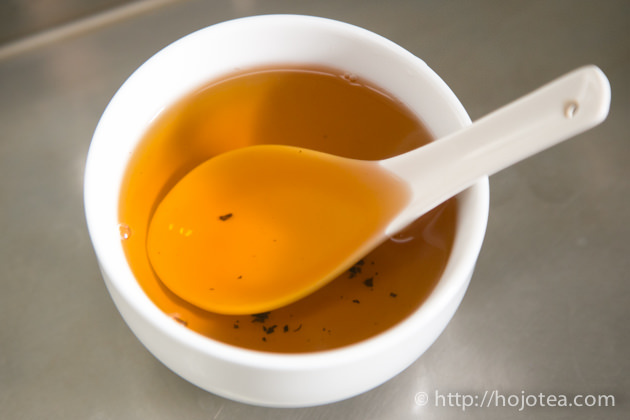 The existence of golden flower indicates that tea is correctly fermented by mold, and the distinctive flavor substances are composed thanks to the formation of secondary metabolite. Thus, the number of golden flower only indicates the process quality, i.e., the fermentation in particular. 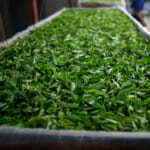 The overall quality of tea is reflected by the quality of fresh tealeaf, i.e., the plucking season, altitude, plucking standard and growing method. Yellow spots are the golden flower. It is the spores of Aspergillus mold. There are several grades of Fuzhuan cha. Generally, the bigger the brick size is, the lower the grade of tea. The lower grade tea is made from the tea plucked in late spring, summer or autumn. The plucking standard of lower grade is also not the same. 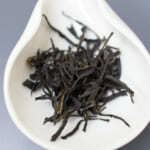 The lower grade tea is made from the long twig that consists of many leaves. 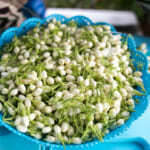 Usually, it gives strong astringency and rough taste. 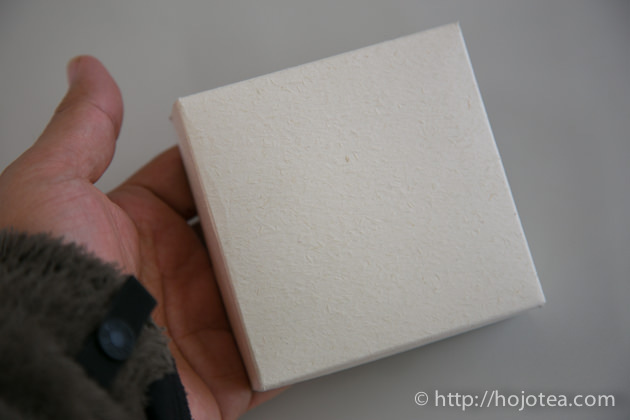 HOJO purchases 200g brick that is made from the spring tea which consists of 1 bud and 3-4 leaves. The next grade is 400g and followed by 1kg or 2kg brick. The photo above shows 400g and 200g brick. The left is 400g and the right is 200g. You may notice that the 400g brick contains more stems and every component looks bigger. On the other hand, tea leaves in 200g brick are smaller. The 200g brick gives tea liquor of deeper aftertaste as it is richer in constituents. 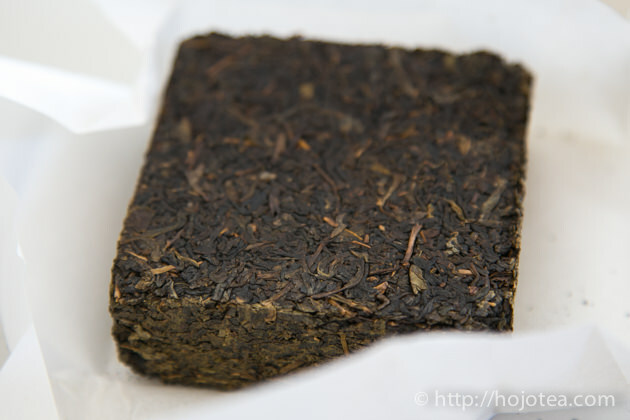 For 1 or 2kg brick, it contains even much larger leaves as they are made from summer tea and/or autumn tea. We carried out the pesticide inspection of >360 types of substances with SGS lab and confirmed that this tea meets Japan standard. Amazing Flavor of Yunnan Street Cuisines! The simple reason why some pu-erh teas has smoky flavor.